Yesterday I posted about retractions in scientific journals, and the assertion that they are going up. I actually woke up this morning thinking about that study, and wishing I could see more data on how it’s changed year to year (yes, I’m a complete nerd…but what do you ponder while brushing your teeth????). Anyway, that brought to mind a post I did a few weeks ago, on how conservatives trust in the scientific community has gone steadily down. It occurred to me that if you superimposed the retraction rate of various journals over the trust in the scientific community rates, it could actually be an interesting picture. It turns out PubMed actually has a retraction rate by year available here. For purposes of this graph I figured that would be a representative enough sample. I couldn’t find the raw numbers for the original public trust study, so these are eyeballed from the original graph in blue, with the exact numbers from the PubMed database in green. 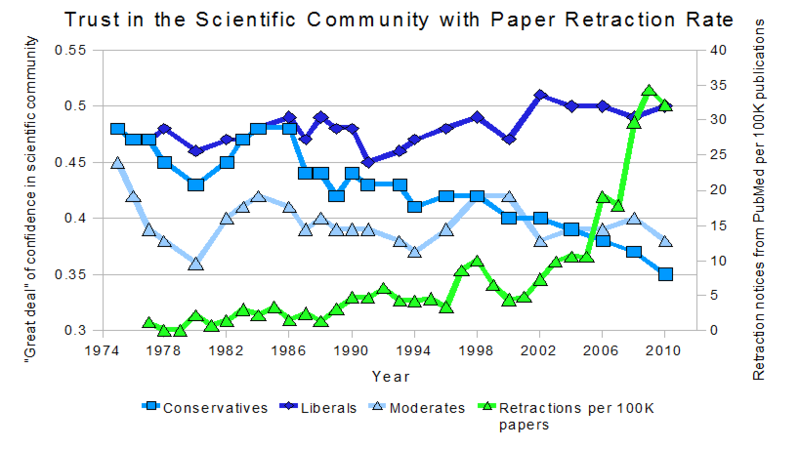 So it looks like a decreasing trust in the scientific community may actually be a rational thing*. It’s entirely possible, by the way, that the increased scrutiny of the internet led to the higher retraction rate…but that would still have given people more reasons not to blindly trust. As the title of this post suggests, skepticism isn’t crazy if you actually should be skeptical. Speaking of trust, I obviously had to manipulate the axes a bit to get this all to fit. Still not sure I got it quite right, but if anyone wants to check my work, the raw data for the retraction rate is here and the data for the public trust study is here. These links are included earlier as well, just wanted to be thorough. *Gringo requested that I run the correlation coefficients. Conservatives r = -0.81 Liberals r = 0.52 Moderates r = 0. I can’t stand by these numbers since my data points were all estimates based on the original chart, but they should be about correct. Have you done any correlation coefficients? I ran them after I saw this, and it looks like the r = -.81 for the conservatives, r = .52 for liberals, and essentially 0 for moderates. Since I don't have the real numbers for the trust survey, I can't guarantee those with any degree of certainty, but I'd feel comfortable saying it was a strong negative correlation for the conservatives, a moderate positive for the liberals, and the moderates apparently don't trust anyone no matter what. Maybe those numbers support the hypothesis that conservatives are more likely to change their opinions based on what they observe happening: more pragmatic and less ideological. It certainly would seem to suggest it….perhaps some of the news outlets who reported this story should have changed their headlines from “Conservatives no longer trust science” to “Liberals maintain their beliefs in spite of evidence”. I'd love for that to hold up for partisan reasons, but even with the pretty dramatic pos correlation, neg correlation numbers you've got, there are a lot of topics in “science,” and there aren't any breakdowns. Not saying you need to even try. Let some even more obsessive person do that. There are plenty. Look how easy it is to do genealogy these days – the obsessives are in communication and the somewhat interested benefit. Otherwise, I think the interesting part about all the stats above are the self defining nature of the word science. The chart says as much about what we think science is as how people feel about science itself. I bet getting the numbers of how many people have social science PhDs would be directly correlated with decreasing trust as well. The more subjective “science” gets, the more people get confused about how they feel. Pretty much the same as every economic article that starts measuring how a president has done on the economy by starting on his inauguration day. You mean I could be responsible for all of it? Awesome!!!! Excellently enough, the rise seems to start when I graduated high school, so I'm thinking it could be reported that my mere presence in academia killed the whole thing. Let's ignore that the wide spread adoption of the internet happened right around that time, I think it's definitely better to just find one person and pin it on them. It's why I've always loved economists. If you review the questions used in the survey which led to the conclusion that “conservatives trust in science has gone steadily down”, I think you'll find that that effort showed no such thing. What it showed was that conservatives' trust in the people responsible for our scientific institutions and in the people holding themselves out as scientists for purposes of public advocacy has gone steadily down. The questions asked, and the responses, revealed nothing about anyone's trust in “science” itself, or in the validity of the scientific method. Instead, the questions had to do with “people in science”, and the results showed a lessening of trust in those people. That's true bobby, I actually tried to say “scientific community” when I mentioned it in the rest of the post, but I missed it in that phrase. I fixed it now. I think the “people in science” question was the more pressing one anyway for the graph. It's not science that led to retractions, it's the misdeeds of the people in science. It's pretty driven by who writes what. A lot of the Man Made Global Warming journals (along with many other topics) were proven to be politically motivated with numbers changed & figures moved this way & that way to generate an outcome. So, I think a lost of trust of the community comes from such actions. A rise in liberal trust also, has been fueled by atheists who believe that it is scientific to not believe in anything that cannot be concretely proven with their current level of science (an action/belief that actually hinders the progression of science) To truly be scientific you have to be impartial and I think we are losing those kinds of scientists every day.